Diamond Dogs is perfect for players who just can’t get enough of cute, friendly, and loveable pets; Dogs to be precise… and everything about this Net Entertainment Video Slot is designed to melt your heart, with adorable dogs featuring in every corner of the game. OK, so there’s one little difference between Diamond Dogs, and the type of pet you might be used to; Diamond Dogs is all about a celebrity, luxurious lifestyle… and while that might sound a little strange, when in the same sentence as dogs… it’s true. The 5 reel, 25 pay line Video Slot incorporates Dogs, and wealth, and you’ll see the mutts embroiled in a life of riches! The symbols you’ll see on the reels include low-paying playing card symbols, which includes 10, J, Q, K, and A, and you’ll also see game specific symbols, including a Bone embroiled in a Ribbon, a Diamond-Encased Dog Bowel, filled with a scrumptious steak, a Fire Hydrant, and a Dog Kennel. 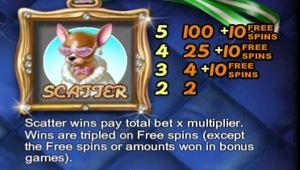 You’ll also see three bonus symbols; the first is the bonus-round symbol, which takes the form of a Dog and the word “Bonus”, while the scatter symbol is yet another dog, this time with the words “Scatter”. The wild symbol is a ferocious-looking Guard Dog, which fittingly places the word “Wild” on top. Diamond Dogs is designed to be available to players on desktop computers and laptops, as well as mobile players, and this means you can enjoy the barkin’ mad world of dogs from wherever you are! Most modern devices are compatible, with iOS, Android, Blackberry, and Windows users able to run the game just fine, in most situations. As always, a strong (4G or WIFI) Internet connection is highly-recommended, although a 3G connection may run the game. 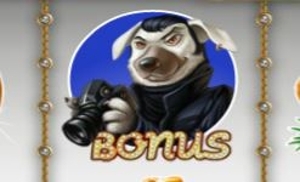 The Celebrity Bonus Game is the main bonus-round in Diamond Dogs, and this is triggered by landing three of the bonus symbols on an active pay line, starting from left-to-right. Note the underlined text; the symbols must be on an active pay line, on reels one, two, and three. Once you manage to land this bonus-round, you’ll be taken to a new screen, where you’ll see 12 Dogs, walking a Red Carpet. Your job, as player, is to photograph the Dogs, which in turn reveals random cash prizes. This continues until you click a dog that displays a muddy paw print, and which point the bonus will end, and you’ll return to the regular base-game. Trigger the free-spins bonus by landing three or more scatter symbols anywhere in view on the reels. Once you do, you’ll receive 10 free-spins, and all wins during the free-spins rounds are subject to a 3X multiplier. You won’t find any sticky wilds, or anything too special during the free-spins, but it is possible to re-trigger the free-spins, simply by landing another three scatter symbols during the bonus.